Featuring a distinct look with full-bleed photography and large cursive text, 1996-97 Fleer Ultra Basketball has aged well. 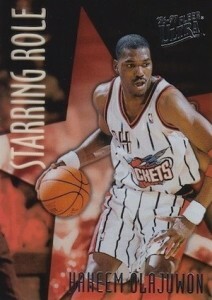 Boosted by the strong 1996 NBA Draft class, 96-97 Ultra is broken into two series releases and offers a nice assortment of parallels and inserts. 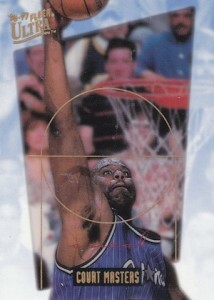 The 1996-97 Fleer Ultra Basketball checklist comes in at 300 cards and is split in half for each series. In addition to regular base cards, a variety of subsets, including On the Block, Ultra Effort, Maximum Effort, Rookie Encore, Step It Up and Play of the Game, fill out the set. 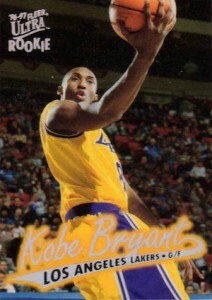 While both Series 1 and Series 2 feature rookie cards, the big rookie cards, like Kobe Bryant, Allen Iverson and Ray Allen, are only found in Series 1. 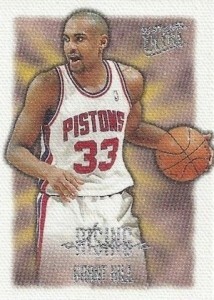 Ben Wallace and Derek Fisher are the notable rookie cards found in Series 2. Continuing the trend from 1995-96 Ultra, 1996-97 includes Gold Medallion parallels and takes things up another level with Platinum Medallion parallels. The foil-centered parallels cover the majority of the base set and are distinguished by the effect on the text on the card front and some also feature a notation under the name. 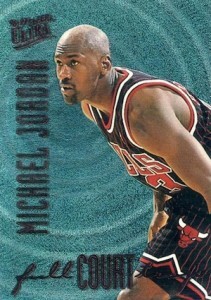 Also, a majority of the parallels include a prefix on the back, with #P- for Platinum and #G- for Gold. While neither parallel is numbered, the Gold Medallion cards are much more common and the Platinum Medallion parallels have a reported print run of less than 250 copies. 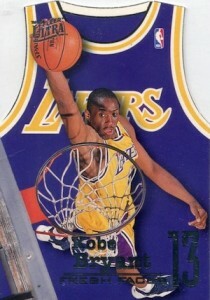 The two Medallion parallels can be seen below alongside the Kobe Bryant base rookie card. The remainder of the product is a large mix of inserts. 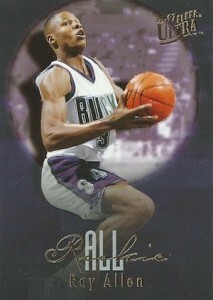 Among the standouts, Court Masters are the toughest pulls at 1:180 retail packs. They are also intriguing given their plastic stock. 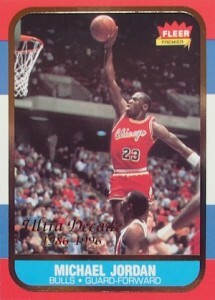 Decade of Excellence is notable because it features the iconic 1986-87 Fleer design with some added gold foil. 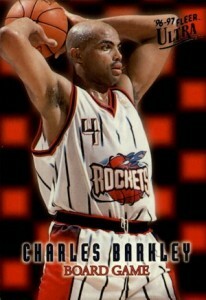 While it is unlikely to be confused with the original release, collectors have likely encountered them when searching for rookie cards for Charles Barkley, Hakeem Olajuwon or Michael Jordan. Tougher to find in good condition, Fresh Faces include a die-cut jersey design and a checklist featuring the top rookie players. Full Court Traps is heavy on foil and the Gold parallel commands good value. 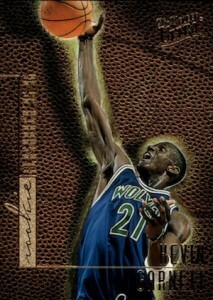 Rising Stars (1:180 packs) has a art-like canvas appearance and is centered on the elite young players. 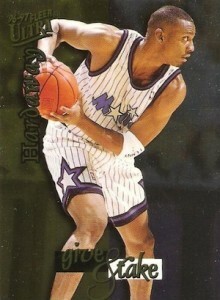 Missing foil can produce slight premiums for the Rising Stars cards. Finally, Starring Role is toughest insert to pull at 1:280 packs. Only found in Series 2, these are some of the most valuable non-rookie options in the product. 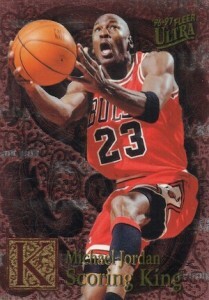 Unlike many of the products from the 1990s, the prices for 1996-97 Fleer Ultra Basketball sealed boxes have not really taken off, but the issue is finding them. When they surface, hobby boxes can be found for around $100 per box. Also, it is important to note the cards can suffer from considerable wear or chipping, especially on the edges. 300 cards. Shop for complete sets. 15 cards. 1:4 S2 packs. 20 cards. 1:9 S2 packs. 15 cards. 1:180 S1 retail packs. 9 cards. 1:72 S1 packs. 10 cards. 1:15 S1 packs. 10 cards. 1:18 S2 retail packs. 10 cards. 1:180 S1 hobby packs. 11 cards. 1:45 S1 packs. 29 cards. 1:24 S2 hobby packs. 10 cards. 1:280 S2 packs.